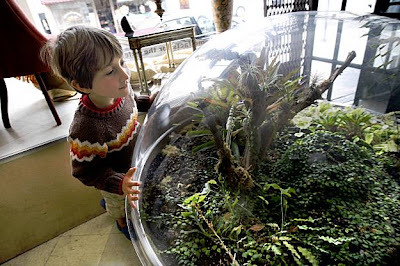 An article entitled "Gardening Under Glass" in the SF Gate covers all aspects of terrariums- with a great nod to Kat Geiger and a nice how-to portion at the end of the story. My favorite is the Terrardome (pictured above) designed by Ric Lopez. Would make a great coffee table centerpiece. There may be no better example than Lopez's circular Terradome, which clearly nods to midcentury Modern design. The 19-inch-wide acrylic dome resembles the iconic 1950s-era depiction of a flying saucer. And though the Terradome ($85) could easily serve as the centerpiece of any high-design household, Lopez hopes it will also serve as an antidote for city dwellers "living in these tight, compacted tall buildings where people are piled on top of each other." It is once in a while attainable or attractive to make one expansive holding divider to decrease the patio nursery to a solitary dimension. Other than on a little slant this would overbear, make a few pieces of the greenery enclosure difficult to get to, and in all likelihood raise the patio nursery so it encroaches on neighbors security.